My children are writing their first term quarterly exams this week. My older girl has a morbid fear of exams. Halfway through the three hour session, she loses her concentration, and gets an anxiety attack. But if she were to attempt the same paper at home, she would have answered almost all the questions correctly. 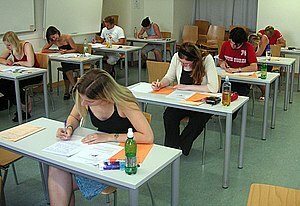 So what goes wrong in the examination hall? The pre-exam tension simply pulls her down. Subsequently, the poor results erode her self-confidence and she finds it hard to get past this. Once she confided in me that she felt she was a “failure” because of her poor grades. She is not alone in this. A lot of students in this country are affected by their school performance. Somehow they directly link intelligence to grades and consider themselves “stupid” if they score poorly in their exams. What is our definition of failure? Does failure mean scoring poorly in tests? In my view, school exams are but just one measure of how well the child has understood the concepts of a subject. It is no way a measure of your child’s intelligence. I know my daughter is a multi-faceted personality and has a good aptitude in a lot of areas. Whether it is painting a canvas in oils, or picking up the latest dance steps in her Bharatanatyam class, or writing a poem about bullies in school for the newspaper, her talents are phenomenal. I don’t need tests to prove whether she is “smart”. But I want her to enjoy the learning process in school and develop the skills and confidence to explore and analyze whatever she sees around herself. Learning must be a joyous experience. If children undergo a rigid curriculum that involves constant testing, will they become successful people in the long run? Hasn’t the system failed them?